First, enter the email address for the member in the "Customer" field. If an account with this email doesn't already exist in Users > All Users, then a new account with this email will be created automatically. Next, choose the Membership Level for this membership. Selecting a level will automatically update the billing cycle and expiration date for the membership. Membership Status - The status of the membership. 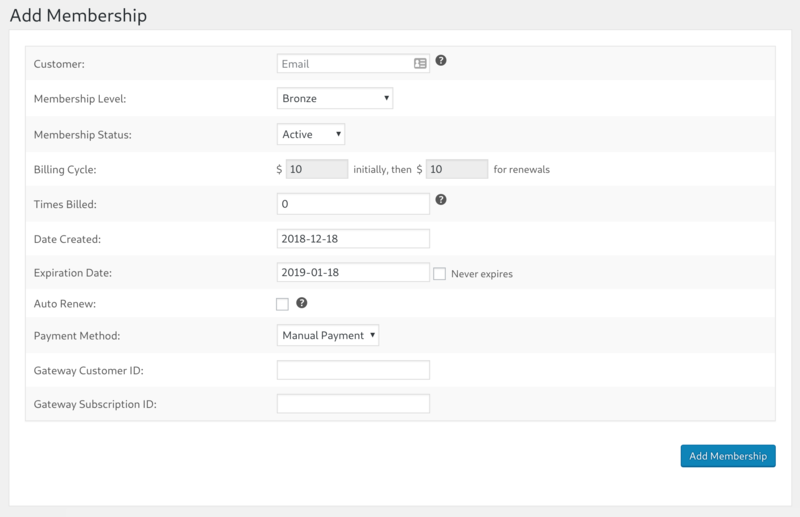 Billing Cycle - This field cannot be customized, but it shows you the schedule for the chosen membership level. Times Billed - The number of payments that have been taken for this membership so far. If this is a brand new membership then leave this value at "0". Date Created - The date the membership was created. Default value is today. Expiration Date - The date the membership expires (or when the next renewal payment is due). Auto Renew - Whether or not this membership has auto renew configured. Note that checking this on does not actually create a subscription at the payment gateway. This should only be checked on if you've already separately set up a recurring subscription at the gateway. Payment Method - The payment gateway used for the membership. Gateway Customer ID - Fill this out if the user already has a profile at the payment gateway. If using Stripe, this value is the Stripe customer ID (starting with "cus_"). Gateway Subscription ID - Fill this out if the user already has a subscription at the payment gateway. If using Stripe, this value is the Stripe subscription ID (starting with "sub_"). Note: when you add a membership to a user manually, you cannot automatically charge that user for the membership. This process simply allows you to grant access to restricted content for special cases, such as when you have given a membership away as a competition prize, or a user has paid with some alternate method.